Minimalism reigns supreme in Logitech’s MX Sound, a dual Bluetooth speaker that combines a simple yet sleek design with a solid sound. Although, it lacks the punch and frills many of its competitors sport, it’s one of the most portable setups. Earlier this year, we selected the Logitech MX Sound as one of the best computer speakers for a reason: not only does it deliver powerful audio despite its small body, it also offers wireless connectivity for flexibility. At $99 (£89, AU$149) a pop, it doesn’t include a sub or any of the extra frills other great speaker systems might have. But with versatile connectivity, a fairly well balanced sound and motion-activated controls, not to mention a beautiful yet simple design, it’s definitely worth the commendation. It’s hard not to love the Logitech MX Sound’s design. The unique circular shape of their cabinets, each fringed with a silver accent ring and covered with high-end fabric, make them look sleeker and less bulky. At 6.30 x 6.30 inches, it’s also the perfect size for a desktop set-up, and its 3.28-inch thickness only makes it even more ideal. As it isn’t designed as a gaming speaker system, it makes sense that it doesn’t have those extra gaming frills like customizable LEDs and a separate dial. However, it does boast a nice little treat that is also utilitarian: the backlit touch controls on the right speaker are motion-activated. They automatically light up as soon as they sense movement and turn off after a few seconds of inactivity. These controls are sensitive so that a light touch is all it takes to turn the volume up/down and activate the Bluetooth for pairing. Lastly, it has an automatic standby mode that’s activated after 20 minutes of inactivity in order to save power. While simplicity is king with the MX Sound, it does have a few nifty features that we found very useful. There are, of course, its motion-activated controls that we discussed in the design section. These three controls—the Bluetooth button and two volume buttons—are located right on the front of the right speaker behind the fabric cover. Since the speakers are so light at 3.90 lbs, they are made to respond to the lightest touch so that you don’t push the speaker out of place every time you adjust or pair a Bluetooth device. Speaking of Bluetooth, these clever speakers may be paired with up to two devices at once, which eliminates the need to disconnect and reconnect different devices. It might not be much, but it’s a practical little feature for couples as well as single users who often flip-flop from one device to another. Like its minimalist style, the MX Sound’s setup is also simple and very straightforward… so much so you almost wonder if you’re missing something. It’s so simple, in fact, there’s not even a user’s manual included in the box—just a four-step process printed on the inner box flaps. You just need to connect the power cord to the right speaker, connect the left and right speakers with the speaker cable, choose your output, and plug it in. There are no power buttons or additional steps. Bear in mind that the speakers do need to be three inches away from the computer, as recommended. There are three inputs—Bluetooth as well as the PC and Aux jacks you’ll find in the back of the right speaker. The headphone jack serves is the only available output. Let’s start with the good stuff. One of the things we love about the MX Sound is that it produces a beautifully balanced sound, its mids and highs are particularly great. Even when turned up all the way, the sound comes out loud without getting blown out or distorted. Considering that all that power is coming from a compact body, that’s saying something. The soundstage is good – not excellent, but there’s a decent separation of left and right, which makes these speakers more than adequate for gaming as well as watching movies on your PC. And the output through the headphone port is controlled well, so personal audio is also balanced and not overwhelming, even at full volume. Of course, at $100, you can’t expect the best, and these definitely have their share of inadequacies. It doesn’t have a sub and it doesn’t have a lot of low end—despite the rear-facing tubes that’s supposed to extend the bass range. This means that it lacks that punch and rumble you’d expect from actual 2.1-channel speakers. While it works well for gaming and action movies, the pivotal moments and actions scenes won’t have that same impact. That missing punch is even more obvious when you’re using the PC or auxiliary ports. The volume through these ports tend to be half as loud compared to connecting over Bluetooth. In general, the high end rolls off a little, resulting in a slightly muffled top range. There’s also that weird compression that happens when you connect your phone via Bluetooth and play music. Somehow, the speakers try to boost the low end to compensate for the fact that it doesn’t have a lot of it in the first place, compressing everything else in the process. The result? It’s as if you’re listening to your favorite tunes while someone’s turning the volume up and down really fast. This is not an issue when you’re playing music from your computer, so we’re thinking that the speakers are more specifically designed for PCs and laptops. Still, since its Bluetooth connectivity is supposed to give users the flexibility to connect and use it with different devices, it’s definitely an issue. Despite these flaws, we’re still impressed by the Logitech MX Sound’s performance. Remember, this is not designed as a gaming speaker system and it only costs $100. It might not have a lot of punch and weird compression issues when you’re using your other devices. 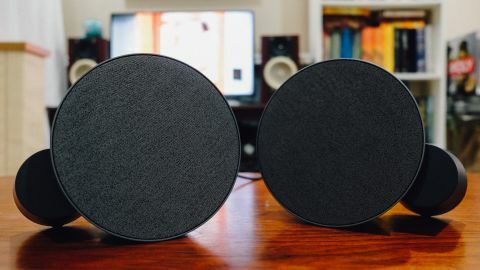 But as a PC (or laptop) speaker, it’s pretty great, producing well-controlled and well-balanced sound as well as a minimalist design that helps reduce clutter on your desk. If you’re used to a speaker system with good bass or a sub, you might find it lacking. But for a small, even portable setup, it’s a nifty set.